Part of the flagship Kyros range of radiators from Rointe, this stylish low level radiator has been produced using the very latest technology to give a very high level of performance in conjunction with a very low level of energy consumption. This entire range has the lowest energy consumption of all Rointe radiators. 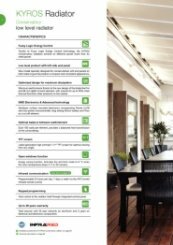 This is achieved thanks to the Fuzzy Logic Energy Control technology incorporated into this range and the average power used by the Kyros radiators accounts for only 39 per cent of the nominal power. Enjoy all of the Rointe efficiency, innovation and design in a conservatory version, available now. The height has been reduced especially in consideration of rooms with large glass surface areas. 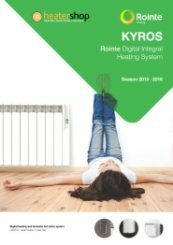 As with other Rointe radiators, the surface temperature of the Kyros range reached only 40 degrees centigrade when the room temperature is set to 21 degrees. This ensures safety for both children and the elderly which makes these units ideal for use in either the home or in public environments. 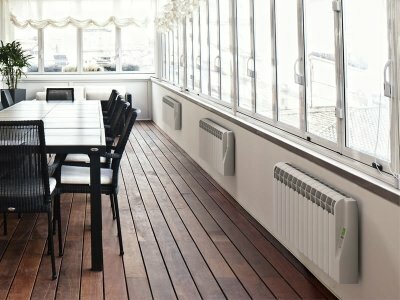 The radiator can be controlled by an infrared AIR Control and is fully programmable over 24 hours per day, 7 days per week. That is really great, thank you for your service and product feedback. That is fantastic, thank you for your great comments. 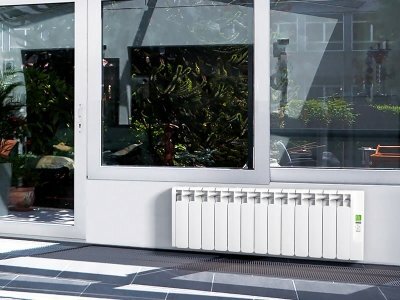 The radiator is exactly as advertised ith easy to use control panel, ideal for conservatories. Accurate sales information, efficient ordering and delivery. Excellent service, well designed website is easy to navigate. Good support by phone when needed. Radiator received next day with clear easy to follow instructions and the drilling template made the fitting simple. Operational radiator installed and operational within two hours. That is fantastic and really great to hear, thank you very much for your feedback. Great service, next day delivery. That's really great, thank you for taking the time to review us. Really efficient and also looks good. Thank you for reviewing us as excellent and I am glad that we were able to sort everything quickly and efficiently. These are excellent radiators, we already had eight in the house and added this one for the new conservatory. Forget everything you think you know about electric heating, these are flexible, fully programmable and economical to run. We are delighted. We have nothing but praise for this company. Our heater wasn't in stock when we first ordered so our payment was refunded immediately. We decided to wait for the next delivery and the heater arrived exactly on time. Tracey called and kept us informed at every stage. Easy online ordering, discount pricing and personal service, a very rare combination. Fantastic, thank you very much for your wonderful review. We try very hard to ensure that all of our customers are kept informed every step of the way and Tracey does this brilliantly.